I have three wishes for this Thursday. I wish that it would stop raining long enough for the raised beds in the vegetable garden to dry out so that I can rip out all the wood that is framing those beds, pull up the landscape fabric in the paths, till up the whole thing, lay out new raised beds, edge them with some kind of stone, and have it all done so I can still plants peas on March 17th. I wish... well, really, I only have the one wish right now. Everything else is moving along as it should this spring. I don't want to get all garden-greedy. Thanks to Cindy at My Corner of Katy for coming up with the idea of Three for Thursday. Dear Carol, may your wish be granted, and those of the fairies and good doctor as well. Doc has a good point, you had better plant those peas somewhere, even if you have to use a container or the World Of Carol will tilt precariously! Hey Fairies, come on over to Tennessee to visit your cousins during the tear up. We have plenty of room! Carol, may you wish be granted. I know how you feel about getting back in the garden! Carol may your wish come true. Carol, I wish that rain would come here to Mumbai instead. we sure could use it! There! that's 2 for the price of 1, right? Aren't you supposed to have 'March winds' and 'April Showers'? Here's hoping the rain slows down and the ground dries out. I just adore your imagination! Your mind just must be full of rainbows and fairies and joy...love every single one of your posts! Delightful... I think you should listen to those garden fairies. Carol, I'm delighted that you, the fairies and Dr H all joined in Three for Thursday! 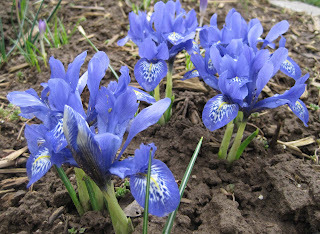 I hope more garden bloggers will do so this spring. Also being a zone 5 gardener, I must say that those garden fairies must still be hibernating in my garden---no sign of them yet! No bulbs emerging thru the snow. Hopefully this week's 40's and a possible 50 degrees will encourage them...I will be on the lookout! I hope all three wishes get granted. If I had three wishes I might spend them all on rain, a warm rainy spring, NO rain the weekend of the Rose Viewing and soaking rains once week, at night, all summer long - except Heath Fair weekend. No rain that weekend - or did I just make four wishes. Me I wish I have sun. I wish I could see the ground. I am tired of seeing snow. Especially since I did see the ground for about 12 hours--in spots--and I know that there are flowers in bud under all that snow. I wish you could send the rain over to me. We need it badly. I have an arabian oil lamp that "may" have a genie in it that you could borrow. . . Your wishes for your vegetable garden seem to require the services of one! Oh! I really pray for you that your wish come true very soon and you do your plan on the time you deceit.